Who is Bill Nye the Science Guy? Bill Nye the Science Guy is an American mechanical engineer and science educator. He is probably best known for being the host of the children's TV show Bill Nye the Science Guy. The show ran for five years (100 episodes) from 1993 to 1998. It was produced by Disney and PBS. The shows were written to appeal to preteen audiences and present topics on natural science in a serious yet fun and engaging way that combined action and humor. Nye has also written several books as The Science Guy. Bill Nye can count Walt Disney as one of his cousins which seems only fitting as The Walt Disney Company was one of his shows producers. Bill Nye's famous kin also include fellow TV personalities Johnny Carson, host of the Tonight Show, and Lucille Ball, star of I Love Lucy. Other celebrity kin include movie actress Raquel Welch, singer and songwriter Taylor Swift, Sports Illustrated swimsuit cover model Kate Upton, and movie actor Matt Damon. 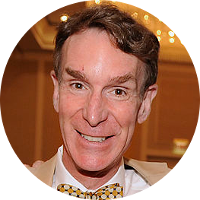 Considering that Bill Nye has written several books, it's interesting to see that he has a number of literary icons among his kin, including poets Ralph Waldo Emerson and Emily Dickinson, and authors Edgar Rice Burroughs and Nathaniel Hawthorne. On July 23, 1941, Edwin Darby Nye, father of Bill Nye, departed San Franciso aboard the S.S. Mariposa and arrived in Honolulu, Hawaii, five days later. Less than two weeks later on August 8, he was aboard the USS Regulus (AK-14), a U.S. Navy cargo ship headed for Wake Island. He was a civilian passenger headed for a new job on Wake Island as a canteen clerk. Exactly four month later, on December 8, 1941, Edwin Nye would be on the island when the Japanese would attack. It was the same day as the Pearl Harbor attack as Wake Island is on the opposite side of the international date line. Although Edwin Nye is often listed among the civilians of Wake Island, that same day according to military records, Edwin Nye enlisted in the U.S. Navy and became one of the island's famed defenders. Wake Island's defenders beat back the initial Japanese amphibious assaults and were able to hold out for over two weeks. Unfortunately on December 23, a vastly superior Japanese invasion force overwhelmed the defenders. Most of the civilian and military personnel were sent to POW camps, among them was Edwin Nye. However 98 mostly civilian laborers were enslaved by the Japanese and kept on the island to help improve its defenses. The island was later successfully bombed several times by the Americans. Among the pilots in these raids was the future U.S. President George H. W. Bush. After one successful air raid by the Americans, the Japanese executed the 98 remaining Americans and buried them in a mass grave. Edwin Nye was sent to China to the Shanghai War Prisoners Camp in Kiawgwan, a suburb of Shanghai. Some sources show Edwin as a civilian POW, while others show him as having a muster date of August 8, 1941, the day of the initial attack. In any case, he would serve out the rest of the war in a prisoner of war camp. Edwin Nye finally received his freedom at the end of the war in 1945. Four years after his capture, Edwin Nye married Jacqueline Jenkins on December 29, 1945, in Baltimore, Maryland. Edwin Nye died in 1997 and is buried in Arlington National Cemetery with the inscription “Wake Island Defender” on his tombstone. His wife Jacqueline, also a Navy veteran, is buried alongside him.